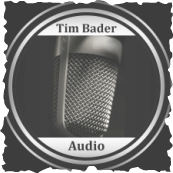 Tim Bader has 10 years of experience in every facet of audio book production and post-production. He studied Music Production and Engineering at Berklee College of Music and honed his craft at one of the largest audio book production studios in New York. He has personally delivered thousands of audio books and educational audio programs to clients large and small. Tim Bader Audio was founded in 2013, and an LLC since 2016.